American Splendor is a popular comic series by the author Harvey Pekar. His rise to fame is an amazing story and is told in the biographical film of the same name (American Splendor). The film is about Harvey Pekar’s rise to fame as an underground comic artist. The elements of traditional comics, as explained by author Scott McCloud, are scattered throughout the film in various ways. Part of McCloud’s discussion on action ratio patterns in Western (American) comics. Superheros shown in the drawings. The superhero is an icon of American comic retelling, with characters who are “normal” get turned into something super human and heroic. Scott McCloud writes of the prevalence and establishment of comic style in his book Understanding Comics. Chapter three describes the unique ratio of scene style and content and how this is distinctive of American comics, the superhero trope being one of these distinctive features. Despite their prevalence, these are not the only stories comics have to tell. The divergence from this dominant superhero trope happens in many comics but none such as the ones found in the underground comic scene, comics produced by a small press or self-publishing artists. The underground comic biography, American Splendor, is one that works to break out of these tropes. The biographical comic of its authors life, Harvey Pekar, is a satirical and darkly comedic retelling of the average life of an average person. Someone who never gets their “superpowers”. In the film American Splendor, the audience is introduced to Pekar’s character as a group of children trick-or-treat on Halloween dressed as their favorite characters. The classic characters are recognized such as Superman, Batman, and Robin. However, the child dressed as the popular, yet underrated, character of Harvey Pekar is not recognized by the woman handing out candy. This introduction sets the tone for the movie as Harvey Pekar’s rise to fame and unique story is told as well as involving the lore of comics. The film tries to recreate the effects of comic books in this different medium in many ways. The film inserts such traits directly such as adding speech bubbles and drawings to the film. 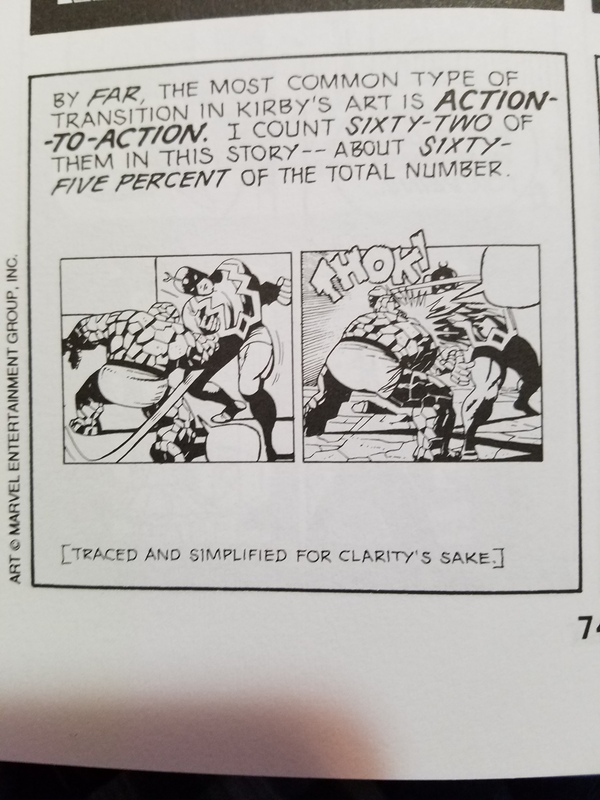 Another way that the film recreates comics effects is by translating comic storytelling methods to film through changing the films storytelling. The film is seen to do this when it adapts the use of comic gutters using interviews with the cast. Interviews with cast members is not something seen in traditional film. However, the film utilizes this. In McCloud’s book Understanding Comics, chapter three describes the use of negative space in general art and in comics themselves. The use of negative space can be hard to accomplish with a seamless and continuous field such as film. However, a break from the biography of Harvey Pekar (the “main” story) is given in the form of interviews. These interviews were with Harvey Pekar, his wife Joyce Brabner, and other cast members. These interviews interrupt and slow down the retelling of Pekar’s rise to success, much like the gutter does in comics. McCloud describes how the break between panels allows for the reader to work and make assumptions about the plot and read further into the story then could necessarily been shown. As such, these interviews give a perspective of the story and a realism to Harvey Pekar’s life that would have been hard to achieve any other way. During the interview scenes the audience is asked hard hitting questions like how Pekar, and people in general, deal with loneliness. This interview acts as a guided gutter as the directors of the film ask existential questions and have the audience work to read further into the overarching story they are being told. The directors of the film not only translated gutters into its storytelling but other themes of comics as well, such as speech bubbles. Scott McCloud talking about sound in comics and how it is delivered. The direct use of speech bubbles in the film is a reference to comics, however, the use of a narration by Harvey Pekar is an adaption of speech bubbles as well. 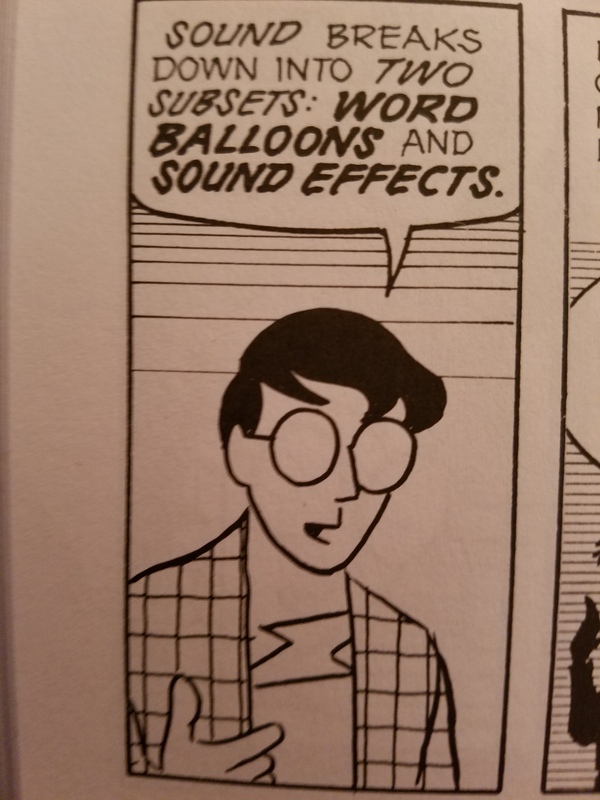 Scott McCloud references sound in his book Understanding Comics on page 116 and how it is relayed in comics through word balloons and sound effects. Since the film is not a comic and doesn’t have to rely on using these methods to convey sound, the audience just hears it. However, this does not take away from the validity of the use of narration instead of speech bubbles. The information of the story, sound, is still conveyed but in unique ways according to form. McCloud describing motivation and the series of steps for creating comics. Narration isn’t the only way that information is conveyed in the film. While it was a useful tactic that followed the lines of comic writing, dialogue had an important part to play as well. The plot point of how Pekar is inspired, when he is sitting in a diner talking with a comic friend, he describes his drive to create the comic American Splendor itself. He views comics as an unexplored medium that could say the things he wants about life. This is a major motivation for him and references a point by McCloud on the process of creation. McCloud describes how a comic book artist must build up their skill and story telling ability, but also much have a story to tell. Harvey Pekar was not a trained comic artist, but he did have a story to tell. Pekar outsourced his story to other artists to draw. Even though it wasn’t his exact art style the story and pacing of what he was saying were the same. The film shows Pekar drawing stick figures that would later be adapted. The art style of Pekar’s character varied from artist to artists, depending on who drew him. The film referenced this when in a conversation between Pekar and his future wife Joyce Brabner, she didn’t know what to expect Pekar to look like when they first met in person. It was an innovation on Pekar’s part to be able to sublimate his skill of writing comics into another artists style. Overall, Pekar found a medium that could expand past what people originally thought of it. Comics were and still are fanciful stories to be told to children. 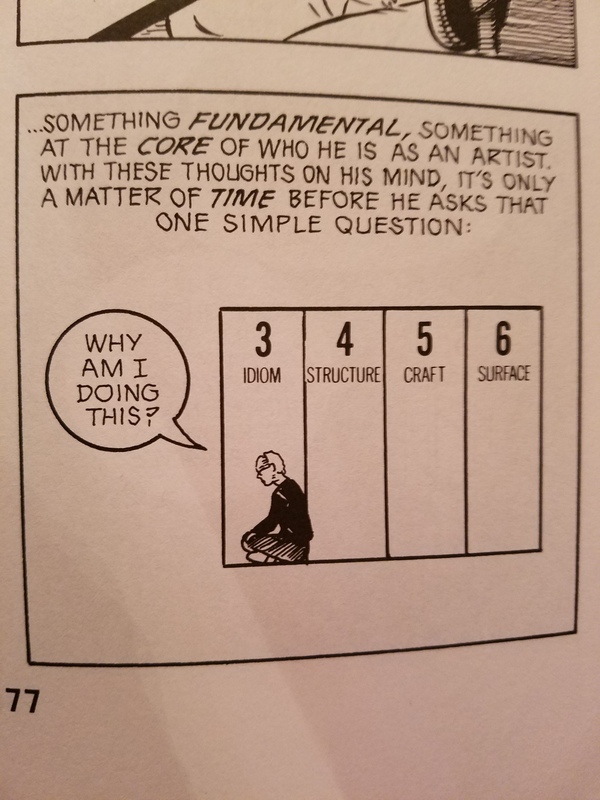 However, Pekar was able to expand what comics told by relating his own experiences and who got to tell them, as he was not an artist in the tradition drawing sense. McCloud points to comics as being a multi-faceted, experimental, and expanding medium that is being explored and should be explored. Harvey Pekar was able to do this in his comics American Splendor. The film American Splendor was able to adapt these comic innovations and create a story we could watch on the screen. The film and the comic American Splendor use the many devices of comic book writing to develop a story that was ground breaking at the time. It was a biography of a normal person’s life written well and in innovative ways. P. (Director). (n.d.). American splendor [Video file]. Retrieved November 22, 2018. McCloud, S. (2018). Understanding comics: The invisible art. Burnaby, B.C. : Simon Fraser University Library.